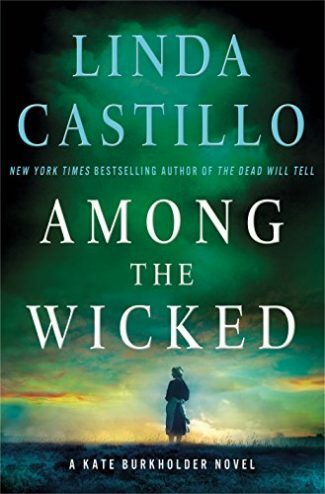 Among the Wicked by Linda Castillo is the eighth Kate Burkholder novel, which finds the chief of police undercover in an Amish community in Upstate New York. Take a visual tour of Among the Wicked with GIFnotes! Representations of the Amish in fiction bring to mind the inspirational romances of authors like Beverly Lewis. We tend to view the Amish as a group of people that are either pious, fantastical examples of a Christian ideal or as simply another group of outsiders with a strange way of life. Linda Castillo’s eighth Kate Burkholder novel, Among the Wicked, appealed to me because it seemed to be neither of these things. As someone who’s grown up close to Amish communities, I was excited to read a mystery that dedicated itself to a complex portrait of a people steeped in contradiction. Kate Burkholder, chief of police in her Ohio town, is living a comfortable life with the man she is dating, enjoying the steadiness of her job and community. Her life is shaken up when the sheriff’s department of a county in Upstate New York comes knocking at her police station. The county, a relatively rural one, houses a sizable Amish population. Said population recently saw the death of a 15-year-old girl, her body found frozen and full of Oxycodone. The sheriff’s department suspects foul play, but the Amish community is not one to communicate much with outsiders. That’s why they call on Kate. As someone who was once Amish, Kate knows Pennsylvania Dutch and their cultural proclivities in a way that almost no other officer could. The sheriff’s department wants to tap her for that knowledge; more so, they want her to go undercover in the community to find out more information. Without someone on the inside, the sheriff’s department runs the risk of continually coming across blocked information. It may upend her life, but Kate can’t stop thinking about the Amish girl frozen in the snow. So after years away from the Amish, Kate finds herself donning a bonnet and simple black dress while making camp without modern amenities in an Upstate New York trailer park. She passes herself off as a widow as she infiltrates the Amish community. What she finds is a group that is reserved—even for the Amish—their distaste for the outside world fueled by their overly charismatic, suspicious bishop. As Kate begins to ask questions, the Amish community reveals itself to be more and more unusual. Everyone is on edge. Even the bishop, while a natural leader, seems to hold secrets upon secrets. Kate may have temporarily returned to a way of life she’s known since birth, but her latest job leads her to conclusions and problems that she’s never encountered before. As a woman undercover, Kate has to tread carefully or risk being found out and destroyed in the name of secrets. Castillo wastes no time diving into the action. She opens with a chapter that gives us our mystery—a prologue following the girl later found frozen—and then hands the rest off to her main character, Kate. Castillo creates a stunning presence and understanding of duality in this mystery, and that is what makes it so compelling. Part of this duality comes from Castillo’s writing. She can go so easily from a domestic Amish scene to something full of action—and when the action comes, she knows how to create the perfect atmosphere. A flash of resolve. A stab of regret. Spinning, she skidded down the bank, launched herself into a dead run across the lake. She didn’t dare slow down. A few yards out, she slipped, fell hard on her belly. Snow against her face, in her mouth. Ice groaning from the impact. A split second and she was back on her feet. She ran for fifty yards. Arms pumping. Boots sliding. Eyes flickering toward the bank behind her. No one there. But where? She continued across the lake. Slower now. Ice creaking beneath her feet. Nearly to the center. Not much farther. A sickening crack! reverberated across the ice. Kate’s day-to-day moments during her undercover work contrast well with the action by showcasing the realities of Amish life. We see Sunday worship and sewing circles among Amish women. While the narrative is obviously focused on Kate’s investigation—more so than a cult-of-domesticity-style image—Castillo marries the cultural setting and the mystery elements with a certain flair. They point out the shades of gray in each other, the things so easily hidden beneath images of perfection and the fulfilling parts of a life we’re not used to. Duality is also present in the actual themes of the mystery. Kate is literally a woman of two worlds—her Amish past and her “English” present are working directly in tandem, informing each other as she must expertly flip between identities. We see how this causes Kate to remember her past in new ways and how that causes her to deeply empathize with the Amish in a way that another police officer never could. “We’re having siess kaffi if you’d like some, Kate,” Laura says without looking up from her work. The coffee is strong and sweet, with just the right amount of milk. One sip and a hundred memories rush through me. I was sixteen years old the last time I had sweet coffee. My mamm took my sisters, Sarah, and me to a neighbor’s farm to see a new baby who had come into the world three weeks ahead of schedule. All the local Amish women had gathered, helping the new mother with her chores—cleaning and laundry—even putting up the tomatoes she’d been canning. Castillo has created a mystery perfect for Kate’s character development. She’s forced to confront what she lived so long ago in a new way—a way that not only shows her empathy but also why said empathy is so powerful for her. We also see how Amish culture can be so differentiated, both in terms of environment and in terms of an Amish community being internally exploited. This mystery isn’t one about red herrings and overly clever clues—this is a community mystery, a mystery about a group of people navigating a manipulative, dangerous misuse of their space. Linda Castillo has a winner with Among the Wicked. It’s insightful, with writing that is razor-sharp and layered, and Kate Burkholder is a continuously compelling character. Castillo knows how to challenge her main character with emotional situations that reflect different types of suspense and mystery. Among the Wicked is perfect for readers who find the Amish fascinating. But, more importantly, it’s for readers that resonate with a complex heroine solving a mystery that resonates with her own personal conflicts. Let’s hope we have many more Kate Burkholder mysteries to look forward to if they’re all this exquisite. Read an excerpt from Among the Wicked! John Jacobson is a college student that likes to get little sleep and advocate for LGBTQ/queer social justice. If he had spare time, it would always be spent reading or watching nostalgic '90s cartoons. He’s a coeditor at Spencer Hill Press and has been a part of the publishing community for over five years. He also writes for Heroes and Heartbreakers. You can find him there, on Twitter @DreamingReviews, and occasionally on his personal blog.